As one year comes to an end, you naturally begin to evaluate how far you’ve come and the next steps to change or do better. 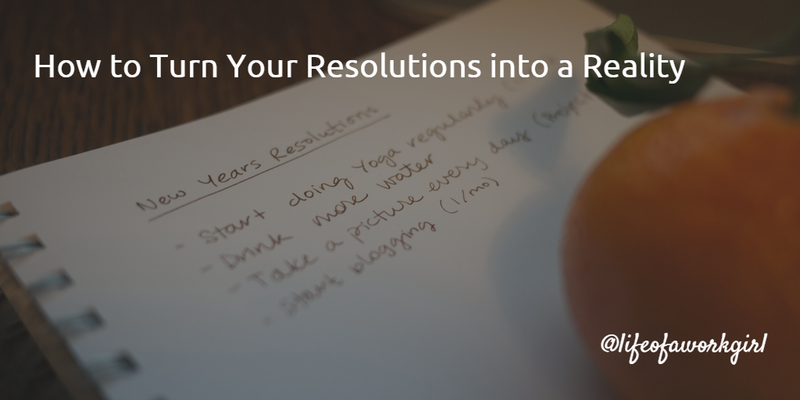 It’s so much easier to make a resolution when you’re in the mood for change! You’re pumped, full of energy and ready to start the new year with a bang. Prioritising is a skill that we all use on a daily basis. From work tasks to shopping lists, we all have a way of ordering tasks in a way that is reflective of how urgent they are. It’s time to transfer this skill! Take a moment to think about the resolutions that really stand out or take up a considerable amount of your day-to-day thoughts. These are your ‘needs’ and they should be put into action first. Doin this will allow you to invest your energy into the most meaningful tasks that (once you’ve reached them) will give you the motivation to keep going! ‘A dream without a plan is just a wish’ and ‘a dream is a goal with a deadline’. No matter how much you may want your goal to become a reality, without a concrete set of steps, it will be hard to see the finish line. Don’t just say, ‘I want to lose weight’ or ‘I want to start saving’ (after all you could loose 1lbs and save £2 in a year, but that wouldn’t amount to much!). Make your goals actionable by saying ‘I will loose 6lbs in 3 months’ and ‘I’ll put £200 into my savings every payday’. Now, your goal has some weight behind it. You’re in the process of creating habits that will transform into better behaviour and, before you know it, these will be second nature. Take a moment to list the things that you do automatically, that need to change. For example, I find myself checking my phone too often (every chance that I can get, when I’m bored). That could be 10 or 15 minutes spent reading a book or doing something productive, just wasted. It is possible to fight the power pf these habits, once you begin to pay close attention to your behaviour. Make the conscious decision to change! It would all be smooth sailing if was just had to rely on our willpower and self-control! Remember that your will also has its own limit – it’s a valuable resource that can be used up if we try to control too many conditions at once. This is why attacking your goals, all guns blazing, often ends with a dramatic relapse into old habits. It’s just not ideal to take on too many non-natural behaviours in one go! Choose no more than two or three at any given time and don’t beat yourself up if your resolve wavers a little bit. Old habits die hard. Willpower can be affected by stress and over-working. But, most importantly, you’re human. And this means that there will be moments that you stumbled along the way. When it gets hard, you might just want to throw in the towel and say ‘I’ve had enough’. Instead, be compassionate. Forgive yourself for the few mistakes that you’ve made along the way and take a moment to appreciate the milestones. Setbacks and difficulties are not failures. They are evidence that you’re trying. If you find that you’re constantly giving yourself a hard time, think about the way you would console a friend in a similar position and treat yourself with the same kindness! I hope that you all have the 2016 you’ve been dreaming of! Let’s turn those goals into a reality, one step at a time.